Pearson eText offers an affordable, simple-to-use, mobile reading experience that lets instructors and students extend learning beyond class time. Students can study, highlight, and take notes in their Pearson eText on Android and iPhone mobile phones and tablets — even when they are offline. Educators can also add their own notes and highlights directly in the eTextbook so that students see what is important for their particular course. 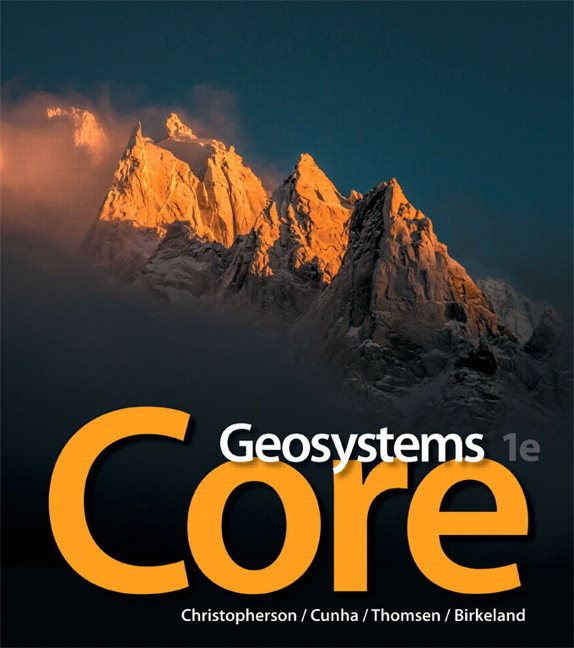 Highly regarded, best-selling author Robert Christopherson has partnered with renowned geographer and educator Stephen Cunha and longtime media author Charlie Thomsen to establish Pearson eText for Geosystems Core, a brief, modular, highly visual and flexible textbook and springboard into physical geography. This approach allows instructors to teach concepts in their preferred order, empowering them to bring in their own case studies and applications to further illustrate the core concepts. Learn more about Pearson eText. Portable access lets students read their eTextbook whenever they have a moment in their day, on Android and iPhone mobile phones and tablets. Even without an Internet connection, offline reading ensures students never miss a chance to learn. Key geographical concepts are presented as two-page modules that can stand on their own and be read in any order. Instructors can assign these flexible modules in whatever sequence best suits their course and teaching style. Each module in the text contains only the most essential content for any concept. The focused presentation prevents students from becoming lost in unnecessary detail. A vibrant and contemporary art and photo program places captivating visuals at center stage as the primary teaching tool with the narrative seamlessly integrated. Information is presented in an engaging and highly accessible format for the non-science major. The introductory chapter gives an applied overview of the fundamentals of physical geography, including mapping, geospatial technology, the Scientific Method, and Earth Systems Science. The chapter-opening Key Concepts list the learning objectives for each chapter. Each section of the chapter is tied to a specific learning objective, providing students with a clear learning path to the chapter content. GeoChecks and GeoQuizzes are integrated into each module, enabling students to check their understanding as they read the module sections, for a “read a little, do a little” approach that is engaging, and that fosters active critical thinking. Chapters conclude with a Chapter Review that includes a module-by-module summary with integrated Review Questions, Critical Thinking exercises, Visual Analysis activities, Interactive Mapping activities using MapMaster, and Explore activities using Google Earth. Unique two-page GeoLab capstone modules integrate a lab experience directly into the book without the need for a separate lab manual or lab section, enabling students to get hands-on with the data and tools of physical geography. The Human Denominator end-of-chapter features explicitly focus on the human-Earth dimension of physical geography within context of the chapter topic. They include maps (spatial data), real-world examples (photos), and review of both current and potential future issues that help engage students by connecting physical geography concepts to their real-world environment. Standalone Climate Change Chapter presents the most up-to-date and comprehensive coverage of climate change science and data, including the 2013-2014 IPCC 5th Assessment Report. The chapter covers paleoclimatology and mechanisms for past climate change, climate feedbacks and the global carbon budget, the evidence and causes of present change, climate forecasts and models, and actions we can take to moderate Earth’s changing climate.